Make seven Scotch pancakes in the Swedish-made Scotch Pancake Iron. Each pancake round is 2.7" diameter. 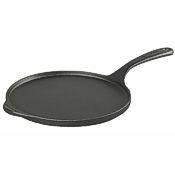 Skeppshult manufactures quality cast iron cookware, and other kitchen products, in Småland. Metal utensils and high heat are safe for this cookware. Thanks to the fine craftsmanship that goes into each piece, your Skeppshult cookware will withstand year after year of heavy use. Skeppshult of Sweden manufactures artisanal cast iron cookware from strictly controlled raw materials in their factory in Småland. Made without harmful chemicals, their products have an exceptionally long life span, which explains how they can provide a 25 year cast iron warranty. 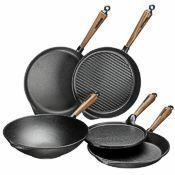 Their natural and environmentally friendly cookware is made without harmful chemicals and requires little maintenance. Skeppshult cast iron is PFOA-free, PTFE-free and cadmium-free. Skeppshult's factory operates the only remaining foundry in Scandinavia making household products in cast iron. Many phases in the manufacturing are still pure hand craftsmanship and dependent upon great professional skill. Undergoing an average of ten quality control inspections before completion, your Skeppshult cookware will withstand year after year of heavy use, metal utensils and high heat. Skeppshult pans are nearly impossible to wear out. Pre-seasoned with organic canola oil, your Skeppshult pan arrives ready to use with a natural nonstick coating. All Skeppshult cast iron cookware performs just as well on gas, ceramic, radiant, halogen or electric ranges as well as induction heat sources. Magnetic cast iron cookware heats quickly, disperses and stores heat better than other cookware material, and works well with high heat. Thanks to these qualities, cast iron provides an excellent roasting surface. Using the right products and traditional cooking optimizes the beneficial iron content of our food. With iron anemia a challenge for many, the best way to help yourself while cooking at home is through slow cooking in combination with foods rich in iron, such as red meat, egg yolks and dark leafy greens. Many foods such as tomatoes also help to increase your iron intake by absorbing substantial quantities of minerals from cast iron cookware. And while many makers use recycled cast iron of questionable safety, Skeppshult uses only virgin iron ore. The bottom of each Skeppshult cookware piece has a slightly concave shape which adds stability to stovetop use and minimizes the risk of injury. Carl E. Andersson established his foundry on the shores of the Nissan river in 1906. Much has happened since then, but Skeppshult's commitment to fine craftsmanship remains strong. In an age of mass-produced mediocrity, a Skeppshult pan is a connection to a timeless standard of excellence. A Skeppshult pan is both tool and inspiration, an investment you'll never regret. The table below should help you understand the differences between the lines of Skeppshult cookware. The Skeppshult Scotch pan is available with cast iron, walnut wood or beech wood handle.